Radioactive iodine is a procedure that is often used to treat hyperthyroidism. The entire goal of the procedure is to put radioactive iodine molecules into your body with the sole purpose of destroying your thyroid gland. Radioactive iodine works by taking advantage of the physiology in your body (1). Because your thyroid gland concentrates and stores iodine in your body. So when you take radioactive iodine your body will automatically take it up and store it in the thyroid gland. This keeps the radioactivity from destroying other cells in your body and only allows for the destruction of your thyroid gland. It is worth pointing out, however, that some other tissues can take up the radioactive iodine such as the beta cells in your pancreas (2) though it isn't clear how much damage exists (if any) in these other cells. But you probably at least know a little bit about RAI or you wouldn't be here. 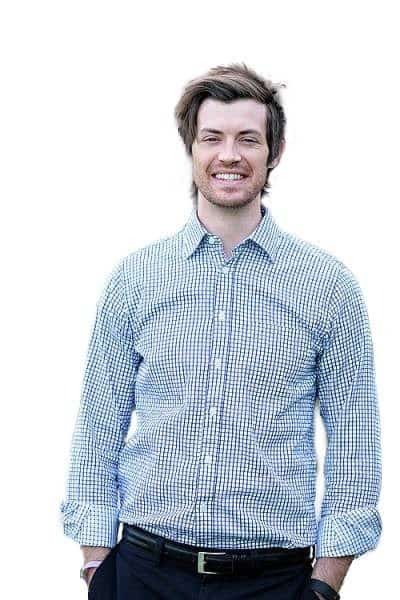 More important than how the procedure works is how it will affect you afterward. Should you expect to live a normal life afterward? Will you be able to maintain your current weight? What medications (if any) will you need to be on? These are the questions that I want to focus on today and hopefully answer many of the current questions that you already have. One of the more surprising aspects of getting RAI done is the fact that you are quite literally radioactive after your procedure. The good news is that this radioactivity does fade over a short period of time (usually 5 to 7 days) but the bad news is that you need to stay under certain precautions during this time. You won't be able to sleep next to people, go to work, prepare food for others, go into public places, fly on an airplane, ride a bus, share utensils with others, sit on a public toilet and so on for about 1 week (3). You probably will not feel sick during this time, but these precautions are in place to prevent you accidentally harming another person! The good news is that this particular side effect doesn't last very long (compared to some of the other issues we will be discussing next). This is probably not what you want to hear, especially if this is a procedure that is necessary for your health, but it's still important to know about it. You may gain weight after you undergo radioactive iodine treatment. It has to do with how important your thyroid is in regulating your metabolism and your weight. And, if you destroy your thyroid gland, it turns out that that may have consequences on your metabolism. Anectodally, you've probably already heard stories about people gaining weight after their procedure. But this goes beyond anecdotal stories. Many clinical studies have also confirmed that weight gain after RAI is a real risk. The good news is that not every single person who gets RAI will necessarily gain weight. But it does increase your risk of weight gain if you have the procedure by about 2 to 3 times. One study looked at 157 people and tracked them both before and after their procedure. The researchers found that the proportion of overweight people increased from 9.6% to 18.5% (almost double) and the proportion of obese patients increased from 6.4% to 21% (almost quadruple) (4). They also found that nearly 1 third of all patients (31.2%) moved into the overweight or obese category from a lower weight category (based on BMI charts by the CDC). 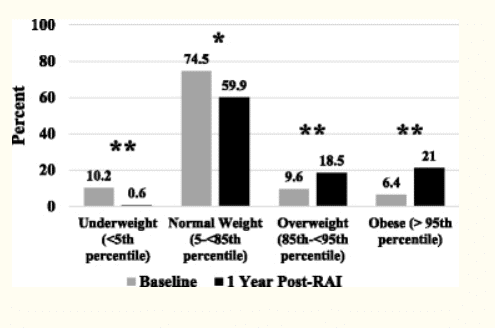 If we extrapolate out this data then it means that on average 30% of all people who undergo RAI can expect to gain some kind of weight. It seems though that people who are already overweight BEFORE their procedure probably have the worst outcome and tend to gain the most weight compared to others. Your best bet to AVOID weight gain after RAI is to go into your procedure with a normal weight and to maintain a healthy lifestyle both before and after. Just realize that you will always be in a 'sensitive' category and you will be more likely to gain weight compared to people with their thyroid intact. This isn't always true, but it is true for MOST people. It turns out that thyroid hormone is actually necessary to not only thrive in life but also to survive. If you don't have thyroid hormone at all then you risk the chance of coma and death. Because of this, people who undergo RAI (meaning those who destroy their thyroid gland) need some type of thyroid hormone replacement. This comes in the form of a simple hormone medication that you can take each and every day to help normalize your thyroid hormone levels. As I said earlier not everyone will necessarily need thyroid medication after they ablate their thyroid. Because it is entirely possible to only destroy a portion of your thyroid gland and not the entire gland. If you destroy the entire gland then you will definitely need to be on thyroid medication. But what if you only destroy 30 to 40% of your gland function? If you fit into this category then you may not need to use thyroid medication afterward. Your Doctor will be able to help determine how much of your gland was destroyed. While we are on the topic of thyroid medication we should also spend a few minutes to talk about other symptoms you may experience. Once your thyroid is destroyed, it will no longer work exactly as it used to. As a result, it isn't uncommon for some patients to suffer from persistent symptoms of hypothyroidism (meaning that they don't have enough thyroid hormone). The presence of any of these symptoms AFTER your procedure (especially if you didn't have them prior to your procedure) may be an early indication that your thyroid medication is not optimized. These symptoms are not caused by the procedure itself but rather a consequence from the damage of the thyroid gland and the inability of your body to produce thyroid hormone. The good news is that you can fairly easily identify these symptoms and you can order tests to determine how well your thyroid is functioning. By looking at markers such as your TSH, free t3, and free t4 you can get an idea as to what is actually going on. If you find that your TSH is high or that your free t3/free t4 are low, then this may be the cause of your symptoms. Don't let this be of major concern to you, though, because in most cases these symptoms can be managed. It may take some trial and error but 80% of patients should approximate normal symptoms over a few months. The other 20% may require additional testing and the use of other thyroid medications which contain T3 thyroid hormone. #5. You should consider yourself "hypothyroid"
This is an extension of what we've already discussed but it's worth spending some time on this specific point. 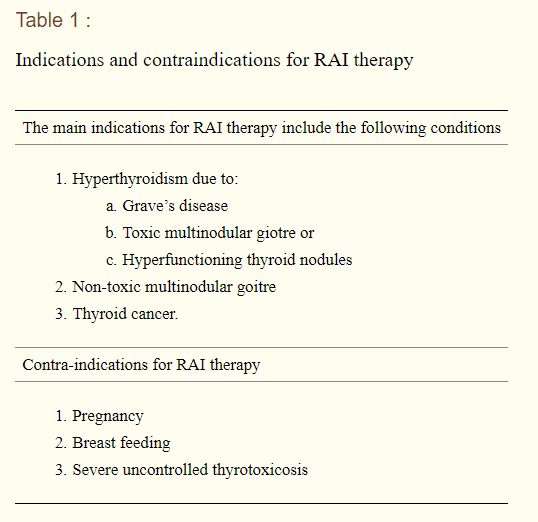 Most people who get radioactive iodine treatment do so because they are considered to be hyperthyroid (sometimes people get RAI for thyroid cancer (5) but most people get it for hyperthyroidism). Hyperthyroidism is the condition where your body produces too much thyroid hormone so the treatment is to destroy your thyroid gland and stop that production. The most common reason for RAI is the autoimmune condition known as Graves' disease (6). The problem is that once you destroy your thyroid gland you are no longer considered to be hyperthyroid. Instead, you are now hypothyroid (7) (meaning you don't produce enough thyroid hormone on your own). This distinction is actually quite important. Because it changes how you should be thinking about your medical condition, it changes the types of natural treatment options which may be available to you, and it changes your treatment. Instead of working to actively reduce thyroid function in your body (which is what the treatment for hyperthyroidism is) you may want to start focusing on how to optimize what little thyroid function you have left. After all, didn't the radioactive iodine work to reduce your overall thyroid hormone production? Now that you are considered to be hypothyroid there is a world of potential therapies, supplements, regimens, and protocols that are available to you. Important to men is the fact that radioactive iodine can cause short-term reductions in sperm count for up to 2 years after your procedure (8). This may or may not be important to you based on your age, your gender, and whether or not fertility is something you are interested in but, again, it's worth knowing about. You can get by this side effect by simply banking some of your sperm prior to your procedure and then using that sperm at a later date with procedures such as intrauterine insemination. If you are a man, just be sure to consider this before you get your operation. Can You Ever Restore Thyroid Function? But why would you want to restore thyroid function to your thyroid gland if you had it destroyed because you were already producing too much? It may sound counterintuitive, but you'll understand why you might want to after your procedure. It turns out, which should come as no surprise, that medications are not a 100% complete substitute for the activity that your thyroid gland does on a day to day basis. There's no way for doctors to give you a pill once a day and for that pill to perform the exact same function that your thyroid gland does every minute of every day. Because of this, people may experience symptoms which may lead them to want to restore whatever thyroid function they can. The answer is maybe, and it depends on the person, how much damage was done to their thyroid, and other factors that aren't always in your control. But, if I was being honest, I think that most people should not rely on the possibility of restoring much thyroid function after their procedure. This shouldn't stop you from trying natural therapies (as long as they are relatively inexpensive and not harmful) but you should have reasonable expectations as you do so. I've certainly seen some patients reduce their total dose of thyroid medication by undergoing some natural therapies to help restore thyroid function after RAI (but the number of patients I've seen in this category is somewhat limited). You can expect to live a fairly normal life after radioactive iodine treatment but your life will probably not be exactly as it was before your procedure. For most people, this means that you can expect to live at 80-90% of your 'normal'. Some people, however, may have further trouble after their treatment and suffer from weight gain, hypothyroid symptoms, and other issues. Perhaps the most concerning of all of the issues after RAI is the weight gain. While you can't control this side effect 100%, you can do your best to mitigate (or reduce) any weight gain by going into your procedure at a normal and healthy weight. Are you thinking about getting radioactive iodine treatment? Have you already had RAI? If so, what are you struggling with? What are you concerned about?